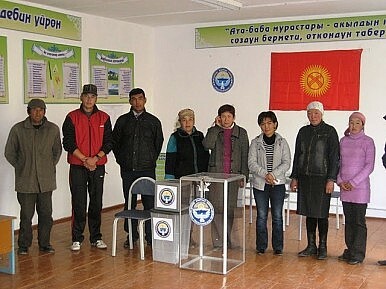 Kyrgyz election volunteers in Kyrgyzstan pose for a photo in October 2010. Personality might supersede policy platforms in Kyrgyzstan’s election–but at least the results aren’t predetermined. As election day approaches in Kyrgyzstan, parties and politicians are jockeying for support. Contrary to other elections in the region, the results of Kyrgyzstan’s October 4th parliamentary elections are not predetermined. In a way, this kind of uncertainty is the hallmark of a competitive democratic election, but the lack of definition between the platforms of the many parties is indicative of the relative youth of Kyrgyzstan’s democracy. The President’s party, the Social Democratic Party (SDPK), is expected to win big, relatively, among the 14 parties vying for seats in the 120-member parliament. Currently the ruling coalition is comprised of the SDPK with 26 seats, Ar-Namys with 25 seats and Ata-Meken with 18 seats. Ata-Zhurt, which left the coalition in October 2011, has 28 seats and Respublika has 23. The five parties represented in the current parliament are expected by analysts to return, with the potential addition of one or two new parties. It’s less than two weeks from the election and 24.kg says that “not all parties have finished their election programs.” Reviewing what platforms and promises have been offered, 24.kg notes that “Most of the parties offer the same. There are many common phrases and the lack of specificity, particularly in the sections dealing with ‘social sphere.’” The American phrase “all politics is local” applies to Kyrgyz politics as well–many of the issues viewed in the platforms reviewed by 24.kg are decidedly local: education, employment, development, healthcare. Who wins and loses on election day and how a ruling coalition is formed will turn on how the election is conducted. Kyrgyzstan is set to debut a biometric data registry to verify voters–if voters failed to register their data (fingerprint, photo, signature) they will not be able to vote. I discussed some of the problems last week–from the de facto disenfranchisement of migrant workers to the very real specter of technical difficulties on election day. While unrest is not expected per se, it is certainly fathomable–voters who gave their biometric information may still not show up on the voter lists. How such events are managed locally, and possibly co-opted by parties that fail to make parliament, will matter greatly.